This was the main Tate garage on Trafalgar Street. "I spent quite a few Sundays at Wellington Street in the mid-80s, waiting for the bus to Middlesbrough. It was even more bleak and windswept on a Sunday with very little nearby." It was very grim, when I was a kid I once was approached in City Square on a Sunday by a creepy man who offered me money to personally show him where the Wellington Street bus station was... i absolutely shudder to think what would have happened if i'd gone there with him. Iirc it was still open and in use well into the 90s, going for the 6am London coach from there wasn't a lot of fun. Hebble entered Leeds via Armley Road & Wellington St, turning left into Queen St, then running round the block to turn right into King St to its terminus outside the GPO sorting office. On departure they turned right out of King St into Wellington St and thence to Armley Rd. For your service to Scarborough you very likely travelled on a Bristol L6B or L6G rear-entrance saloon (or its LL or LWL variants) with Eastern Coach Works bodywork, belonging to West Yorkshire Road Car. 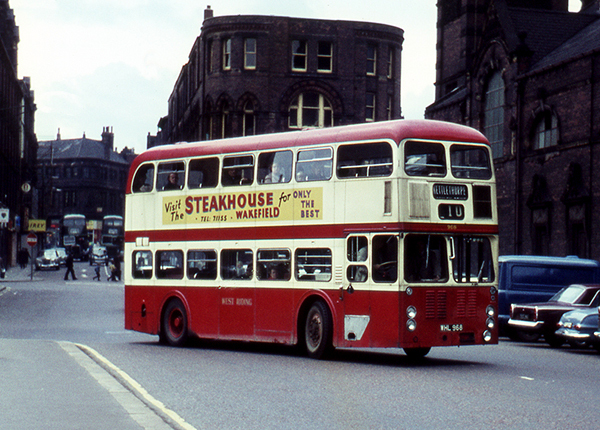 Its service 43 originated in Bradford, via Calverley, Rodley & Kirkstall to Wellington St Coach Station, then went on to Vicar Lane Bus Station to pick up passengers who had travelled into Leeds on other WYRCC routes, and then went via York and Malton to Scarborough. Many 43 journeys ran short between Wellington St and Scarborough, and between Leeds and York. This service is now one of those operated by Yorkshire Coastliner, itself a successor of the privatised WYRCC, although Bradford is no longer served. Thanks to everyone for their replies to my query. One thing they do show is how essential it is that photographic records are kept of things and also how useful the SL website is. Oh, and also how quickly I forget things as I had totally forgotten about the West Riding Bus Station that would be partly about where the Co-op store now is. Here's a West Riding bus pulling out of the small bus station on New York Street. Where abouts exactly was that on Lisbon Street Brunel? The buses parked on the road. I will try to find further details.